Just because you may not have an oven or refrigerator at hand doesn't mean you can't get your protein fix in during the day. There are plenty of options that you can throw in a lunch box and be set without any excuses. Most pre-made snacks are made with artificial ingredients and poor nutritional value, especially when it comes to protein. Here are some ways to bump up that daily protein in-take either at work, school, or on the road. Greek Yogurt is a great and travel-easy way to get that protein in. It's usually high in protein and lower in carbs and fats. Try to get the plain flavor when available to cut back on that added and unnecessary sugar. 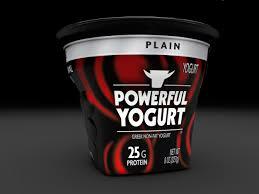 Powerful Yogurt uses a proprietary straining process that retains the yogurts natural protein. One pack includes 25 G of protein and only 140 calories. It's extra protein helps in all areas- especially building muscle or timing down. Mix in your favorite fruit and some cinnamon for extra flavor. With the main ingredient being chickpeas, this dip favorite is full of protein and fiber. Place some raw veggies or whole grain crackers in a baggie and you've got an energy filled snack. Wild Garden Hummus Packs have around 60 calories, 3 G of fat, 3 G of carbs, and 6 G of protein. Use 2 packs for only 120 calories and 12 G of protein for an even more muscle-building snack. Their flavors include Original, Black Olive, Jalapeño, Fire Roasted Red Pepper, Sun Dried Tomato, and Roasted Garlic. Some protein bars can be tricky. Yes, some can taste like a candy bar, but that also might mean that they have the equivalent nutritional value as well. However, the industry has come around to create some of the cleanest choices that also give you the perfect go-to protein fix. NoGii is a great choice that's also gluten-free. It has the ideal balance of protein, fat, and carbs for a pre or post workout meal. It also comes in 4 different flavors- Peanut Butter & Chocolate, Chocolate Coconut, Chocolate Mint, and Cocoa Brownie. Don't miss their SUPER protein bars with 30 grams of protein for you guys. Being newly introduced to the industry, these chips are at an all-time high. Moving away from the traditional sweet powders and bars, they give a chance for salt-lovers to have a new snack. Quest Protein Chips include 20 grams of protein with very little carbs and fats. For people following a low-carb diet, this is a great choice. The flavors come in Cheddar & Sour Cream, Salt & Vinegar, Sea Salt, Sour Cream & Onion, and BBQ. This has been a go-to high protein choice for years. It's usually low in fat and carbs, but very high in protein. Now the jerky industry has evolved from only beef to all kinds of leaner jerky will endless flavors. Krave Jerky has a numerous amount of meat choices along with different flavors. They carry Pork, Turkey, and Beef as meats and flavors like Lemon Garlic, Chili Lime, Sweet Chipotle, and more.